James Ermatinger, Dean of the College of Liberal Arts and Sciences at the University of Illinois Springfield announced today the appointment of Peter Boltuc as the Louise Hartman Schewe and Karl Schewe Professor in Liberal Arts and Sciences. “We are proud of Peter Boltuc’s international reputation and his interdisciplinary approach to teaching and scholarship. 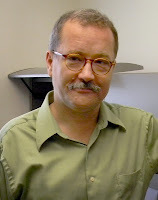 His work in moral and political philosophy and machine consciousness across fields make him an ideal Schewe Liberal Arts and Sciences Professor,” said Ermatinger. Boltuc, a professor of philosophy, serves on the editorial boards of several scholarly journals, and is editor of the American Philosophical Association Newsletter on Philosophy and Computers, which under his editorship has become a full-fledged academic journal. Boltuc has maintained an extremely productive research program, with well over 100 peer reviewed articles and presentations. At UIS, Boltuc served as chair of the Community Outreach Partnership Center, administering a substantial U.S. Department of Housing and Urban Development grant. He served as chair of the philosophy department from 2003 to 2006, and used that position to establish the nation's first online B.A. degree in philosophy. He has maintained active collaborations with Europe, especially with the Warsaw School of Economics. He currently serves on the UIS Campus Senate, and is the vice chair of the University of Illinois Senates' Conference. Boltuc has a long history of service both inside and outside academia. He chaired an advisory committee for culture to Lech Walesa in his first presidential campaign in 1990. He has two Ph.D. degrees in philosophy, one from the University of Warsaw and one from Bowling Green State University. Before coming to UIS, he held visiting fellowships at Oxford University and Princeton University, and taught at St. Olaf College. Karl Schewe was a member of the Chicago Board of Trade and A.G. Edwards and Sons, Springfield. Louise was a teacher and active civic leader whose interests included the Springfield Art Association and the Illinois Symphony Guild. Upon her death in 2006, Louise Schewe left a generous bequest to the University of Illinois Foundation to support initially a Professorship, and eventually a Chair in the Liberal Arts and Sciences. For more information, contact Derek Schnapp, UIS public relations director, at 217/206-6716 or dschn3@uis.edu.